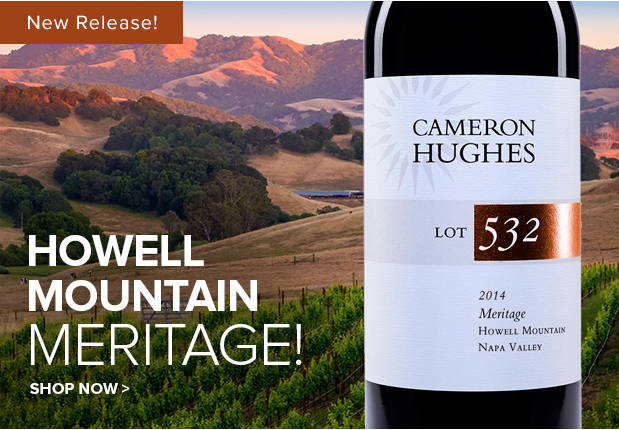 Just Released: A Howell Mountain Red Stunner! Another Howell Mountain stunner has arrived for the season. Comprised of Malbec, Cabernet, Petit Verdot, and Merlot, our Lot 532 2014 Howell Mountain Meritage is anchored by a fantastic lot of Malbec we pretty much had to beg for (winemakers get attached to their babies, but owners can be a bit more pragmatic), with the balance sourced from our Las Posadas Howell Mountain Cabernet program. Simply put, a Howell Mountain red blend of this top shelf quality is a screaming deal at $25. All the components in this blend saw open top, small lot fermenters and were aged for 18 months or more in 50-60% new French oak. The anchor wine is sourced from one of Howell Mountain's legendary estates, with sprawling high-altitude ridgetop vineyards that are recognized as some of the best dirt on Howell Mountain. Combined with our Las Posadas Cabernet, the resulting blend combines the spicy wild berry character of Malbec with the depth and structure of Howell Mountain Cabernet. More than just about any cuvée, this wine illustrates what we do best as negociants eleveur. You can thank the fantastic ’14 vintage for this cuvée being ready to rock right out of the bottle, with sweet florals, chocolate, red rock, and wild berry complemented by dusty cocoa and sweet toasty oak. Rich fruit impact and ample structure produce a long, lush, velvety finish with cassis, black cherry and spice echoing through mouth coating tannins. Just awesome and ridiculously approachable already. As a New Release special offer, go ahead and take 15% off any purchase of one case or more through Sunday night at midnight (Wine Club members get 20% off) as long as the order includes one bottle of Lot 532 (mix and match the whole store! ).